This greeting comes a few days late, and for good reason. 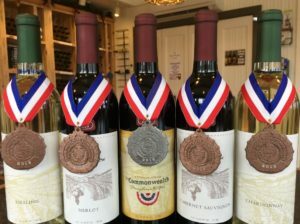 We had been “sworn to secrecy” regarding announcing until today that we won some awards at the 2019 Pennsylvania Farm Show Wine Competition. We entered five wines in the competition (held in early November), and we were awarded five medals: a sweep! The Commonwealth is our tribute to classic French red bordelaise-style wine: a blend of 36% Cabernet Franc, 35% Merlot, and 30% Cabernet Sauvignon. 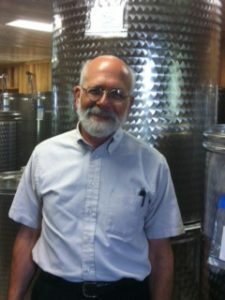 Both the 2017 Riesling and 2017 Chardonnay are the finest wines that I have tasted and seen over my past six vintages here at Logan’s View, characterized with excellent true-to-variety fruitiness, body and balance. The Merlot is marked by beautiful balance of oak, fruit, soft tannin and acidity, and is one of our best Merlots from the past six vintages. 2015 Cabernet Sauvignon is exhibiting the benefit of receiving extended aging, after 14 months in bulk storage and 22 months in the bottle. Both bouquet and flavor are integrating really well, and this wine will continue to improve over the next years. So, the 2018’s are currently clarifying in the case of fruits, whites and rosés, and the reds have begun barrel aging. We truly appreciate your business, and have a very Happy New Year! Enjoy your wine in good health! This has been one tough vintage to handle. Plus, just trying to get people to work the vineyards when you need them to do so. Even with this, we’re still making some very good wines from a not-so-stellar vintage. Varietal character (the smell of the grape as crushed) is at lower levels: we’ll have some very delicate wines this year, with some wines probably not be bottled under their characteristic name. There are, however, some exceptions. Our supplier for Chambourcin grapes, who has been consistently diligent in producing meticulously raised fruit: the 2017 and 2018 Chambourcin red wines and the 2018 Logan’s Rosé are very nice with very good fruit aroma, good body, balanced acidity with very clean fruit flavors. But, there will be no 2018 Cabernet Sauvignon, like there was no 2013: we had to use it only for Cracklin’ Rosé as opposed to a red wine due to less than optimal weather ripening and vineyard management issues. Sometimes I have to make tough choices with what to do with the harvest. Expensive fruit for less than optimum wine. Sorry about that, but we do still have the excellent 2015 and 2016 vintages of Cabernet Sauvignon bottled, and the 2017 to be bottled soon. The good news is that the 2016 reds, which have been bottled, and the 2017 reds which will be bottled very shortly are both very good wines and are tasting quite well. The 2016 reds have had around 11 months of bottle age and are developing their bottle-aged bouquets. The 2017 reds are clean, overall moderately intense of the grape variety with a nice complementing dose of oak, and should develop well over the next 5 years or so in the bottle. The 2017 Riesling and 2017 Chardonnay, both currently available at our shop and at selected restaurants, are the finest examples of those grapes that I have tasted and seen in our past six vintages I’ve had the pleasure of making. So, keep the Spotted Lanternfly at bay, report it to Penn State when you find it, and enjoy your wine in good health! I don’t want to be accused of being too technical, and please forgive me, but we do have a serious economic agricultural problem with an invasive pest: the Spotted Lanternfly. If we don’t control it, it will kill us. Presently a quarantine area exists in Pennsylvania covering the Delaware River west to the Susquehanna River, with not quite all counties being affected. Thirteen counties in southeastern Pennsylvania are now under quarantine for this insect. However, major economic damage has been happening and crops are being lost. One grower alone is reporting going from 150 tons of grapes annual average harvest to less than 5 tons this year. Grape price are skyrocketing, where the grapes are available. Some vines are dying completely due to their inability to overwinter after infestation. And grapevines are not just the only crop being affected: up to $1 BILLION plus in potential damage to Pennsylvania agriculture alone, if we do not stop this pest. The spotted lanternfly’s preferred host is an oriental Tree of Heaven (Ailanthus altissima) and grapevines. It feeds on grapevines by piercing the vines and feeding on the phloem and xylem (fluid and nutrient transporting tissues). This feeding causes intracellular damage as the insects siphon vast amounts from the phloem which drastically reduces the vine’s health and vigor. The insects excrete “honeydew” and the feeding sites leak sap, which causes sooty mold to form on the plant’s leaves, reducing photosynthesis (sugar-making capability) of the plant. The sap also attracts wasps and bees. The wounds make the host plants more susceptible to disease. Insect feeding is damaging as there is a constant inflow of insects from surrounding wooded areas. The insect eventually lays eggs at the end of the season, and the adult insects die. When you discover them, remove and destroy the egg masses immediately. SO: Kill the beasts. Report the beasts. DO NOT TRANSPORT EGG MASSES OF THE BEASTS. Please go online to visit PENN STATE UNIVERSITY website and learn what this pest looks like. Enjoy your wine (while you still have it) in good health! Wines in the bottle are chemically alive and over time evolve. I’ve written in the past about well-aged Ice Apple and Chambourcin wines. We deliberately try to handle our fruit wines as very little as possible to preserve their qualities of fresh fruit color, aroma and flavor. There are times when bottles of blackberry wines drop a white- to pink-colored precipitate of ellagic acid. Ellagic acid is proposed to be one of the most powerful naturally-occurring anti-carcinogens found in the “dark fruits”. It appears as a sometimes unsightly but totally harmless precipitate, and even though winemakers don’t appreciate its appearance, it occurs naturally. Hot Cars, It’s too darn hot! We’ve gone to great care to produce the best possible wine we can for your enjoyment. Please remember that your bottle of wine is still evolving, changing and improving, as long it you store it properly. Please protect your wines from heat inside your automobile. If you personally are uncomfortable with your automobile’s temperature, it is also “uncomfortable” for your wine. Believe it or not, on an overcast 85°F day, the temperature inside your vehicle will top out at over 140°F within about half an hour! Not only does this cook a steak to medium and hard cook an egg, but it will ruin your wine, let alone killing Fido or Tabby. Enjoy your wines in good health!